The new generation of networking devices in the range are claimed to be ideal for households with high bandwidth needs, such as those with video monitoring security systems or streaming 4K video to devices. Netgear's Orbi Whole Home Wi-Fi System utilizes Fastlane 3 technology and is claimed to be capable of delivering sustained gigabit Internet speeds across the wireless connection. The units will offer Wi-Fi 6 connectivity, a recent rebranding of the Wi-Fi naming system that translates to 802.11ax, for the backhaul. Added on top is 2014 QAM with a 4x4 backhaul between the router and satellite units for increased speeds, coverage, and capacity. New models will feature a quad-core Qualcomm System-on-Chip and be capable of hosting up to 12 concurrent streaming services on the tri-band networks. The changes also means each node of the network will have four time the capacity, making it ideal for hosting smart home appliances that can put a strain on some networks that are unable to handle high device counts. The first Orbi models with Wi-Fi 6 will start shipping in the second half of 2019, starting with the Orbi RBK50-series devices. Pricing for the new models has yet to be announced. I know the WiFi numbers are supposed make it easier for the average person to differentiate versions but I still think I’m going to have an easier time remembering by the IEEE designation. It's time for WiFi 6 supported not only in networking gears but gadgets like Phones/tablets/computers to take advantage of. Is it safe to assume WiFi 6 2019 phones or 2020 is right timeline along with 5G support. At some point I’m going to have to replace my Airport Extremes, both the flat and later tower models. I haven’t yet found anything that performs as well in my home. I get 400-500Mbs in most places. But I need 4 routers to do it, because my home is like a Faraday cage. So far, nothing I’ve seen, and in some cases, tested, comes close. Apple may, or may not be using mesh technology, but it acts as though it is. I extend my network using the same network name and password, just as mesh networks do, and I have handoff between the nodes, just as mesh networks do. i wish Apple wasn’t losing interest in product lines that aren’t major. This is one in which their products really do upend the competition. All well and good but TimeMachine support in the current router is far more important. 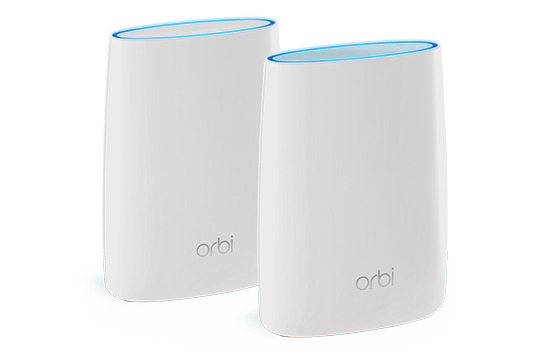 I agonized over the move away from Airport Extreme and I must say, after MUCH research, the ORBI system works GREAT! Easy to set-up, ZERO effort to maintain. There's even an iOS app to manage the network, install firmware updates, etc..
My apartment building is pre-war steel, brick and concrete. I found a decent, almost direct sightline between my two units and have had no trouble at all. Orbi are considered the best. Just wish routers weren’t so damned expensive. It’s a lot harder with two floors, an attic and a basement. Most all the interior walls are brick, covered with 3/4” x 2” wood, spaced at 16”. That’s covered with a diagonal wood lath, to which is fastened a galvanized mesh. On that is 3/4” mortar, 1/4” plaster, and lord knows how many layers of paint, the oldest of which have some lead base. The ceilings have the lath and all the rest. The house is from 1925. They didn’t think of WiFi then, I guess. i tested the ORBI. Didn’t do too well here. I don’t care about the price. It’s just every few years, or so. Just bought the Orbi RBK50 system. Massive improvement in reach, full speed throughout the our big house and very easy to set up. The only neg is these units are very big. The uibiquiti HD are smaller and much better looking. But I got the Orbi at one third the price of those on sale. i new ax was coming, but needed to update. No regrets I tell myself! Home connectivity (driven by 4K/5K as well as automation) will become major products -- if not for Apple then for somebody else. I am hoping that Apple doesn't continue to avoid these markets. It is where we could most use their design expertise. For a very long time, Apple has been a company with a fairly small number of products, and product lines. That became even more true once Jobs came back. If something didn’t sell to expectations-out it went! Apple doesn’t have the patience to nurture a product line, either software, or hardware. they also don’t like products that aren’t, for whatever it means, iconic. Sure they have to sell cables, adapters and chargers for their other lines, but otherwise, no. So routers didn’t have enough sales, I would imagine for them to bother. The last new product was, what, about 5 years ago? They didn’t expect sales to suffer because of that? In the past iTunes supported the iPod and each made the other possible. Today, the Apple Watch enhances the iPhone and the iPhone is stronger because of it. I see home automation along with significant advances in communications technology as a significant growth path and prime territory for Apple and the strengths it derives from its product integration and privacy. I would hate to see Apple abandon that market or get pushed out it. I won’t argue about that. I agree. But Apple doesn’t seem to see it that way. If they discontinued this product line without dissolving the division and dispersing the engineering teams, I would be inclined to think that they are working on something big in the area, and just want to rid themselves of the old stuff while the new stuff was being developed. but as that’s not what happened, Apple appears to be thinking that it doesn’t matter to them. I don’t get it. Now, more than ever before, an integrated solution is imperative. Apple has proven, in the last, that they can do this very well, and they certainly have the resources to do it right. I do like Netgear, perhaps Apple shouldd just buy them, and get into the networking business altogether.